^ Ewing Young Route. compiled by Karen Bassett, Jim Renner, and Joyce White. ^ Polk did not desire war, believed the Oregon claim: Haynes, p. 118. John Bull quote: Pletcher, p. 328. Rejects arbitration: Pletcher, p. 322. ^ Pletcher, pp. 237-249, 296-300; Haynes, pp. 118--120. ^ Both Pletcher (p. 223) and Rosenboom (p. 132) note that the slogan was not used in the election. Pletcher also notes that many textbooks get this wrong. See also E.A. Miles, "Fifty-Four Forty or Fight": an American Political Legend, Mississippi Valley Historical Review 44(2), September 1957, pp. 291–309, and Hans Sperber, "Fifty-four Forty or Fight": Facts and Fictions, American Speech 32(1), February 1957, pp. 5–11. ^ Diplomatic victory for Polk, Haynes p. 136; brinkmanship, Haynes p. 194; Pletcher quote, p. 592. Haynes, Sam W. James K. Polk and the Expansionist Impulse. Arlington: University of Texas, 1997. Pletcher, David M. The Diplomacy of Annexation: Texas, Oregon, and the Mexican War. Columbia, Missouri: University of Missouri Press, 1973. Rosenboom, Eugene H. A History of Presidential Elections: From George Washington to Richard M. Nixon. Third edition. New York: Macmillan, 1970. 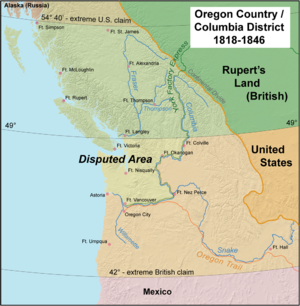 1844 Democratic platform, which asserted that the U.S. "title to the whole of the Territory of Oregon is clear and unquestionable"
Another reference work that mistakenly ascribes the slogan Fifty-Four Forty or Fight to Polk is the Encyclopadia Britannica. URL last accessed December 16, 2005. 54-40 or Fight shows the quilt block named after the slogan. In this time period, women frequently used quilts to express their political views.